RocketModeler, KiteModeler, the Atmosphere Applet and the GasLab meet many of the National Mathematics and Science Standards. National Mathematics Standards: Mathematics as Problem Solving, Mathematics as Reasoning, Mathematical Connections, Algebra, Functions, Geometry from an Algebraic Perspective, Trigonometry, Discrete Mathematics, Conceptual Underpinnings of Calculus, Mathematical Structure. National Science Standards: Science as Inquiry, Physical Science, Life Science, Science and Technology, Science in Personal and Social Perspectives. 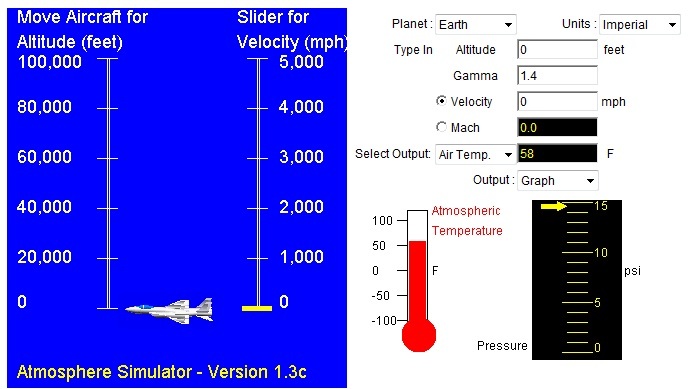 RocketModeler III was developed at the NASA Glenn Research Center in an effort to foster hands-on, inquiry-based learning in science and math. 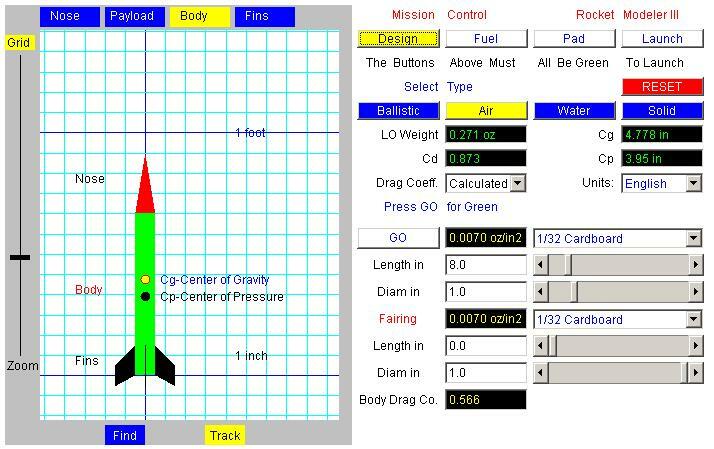 RocketModeler is a simulator that models the design and flight of a model rocket. You can change design variables including the size, and shape of the rocket body, the fins, the nose cone. You can also select different materials for each component. The program calculates the weight of the rocket and determines the drag coefficient from a table of experimental data. You can select from a variety of standard solid rocket engines. The program computes the center of gravity and pressure for your rocket and determines the stability. When you have a design that you like, you move to the pad, where you can launch your rocket and observe its flight trajectory. You can pause at any time to record data and then continue the flight through parachute deploy and recovery. The program models stomp rockets, bottle rockets, and ballistic shells in addition to solid model rockets. It also supports both English and Metric units, and you can fly your rockets on the Earth, Moon, or Mars. Go to the directory where you have stored "RocketModeler.zip" and open the program "WinZip". "Extract" all the files. If you skip this step, you will only see a grey box when you attempt to run RocketModeler. Click on rocket.html to launch your browser and load the driver program. KiteModeler was developed in an effort to foster hands-on, inquiry-based learning in science and math. KiteModeler is a simulator that models the design, trimming, and flight of a kite. The program works in three modes: Design Mode, Trim Mode, or Flight Mode. In the Design Mode (shown below), you pick from five basic types of kite designs. You can then change design variables including the length and width of various sections of the kite. You can also select different materials for each component. When you have a design that you like, you switch to the Trim Mode where you set the length of the bridle string and tail and the location of the knot attaching the bridle to the control line. Based on your inputs, the program computes the center of gravity and pressure, the magnitude of the aerodynamic forces and the weight, and determines the stability of your kite. With a stable kite design, you are ready for Flight Mode. In Flight Mode you set the wind speed and the length of control line. The program then computes the sag of the line caused by the weight of the string and the height and distance that your kite would fly. Using all three modes, you can investigate how a kite flies, and the factors that affect its performance. The downloaded file is in .ZIP format which you must store on your hard drive when prompted by your browser. Go to the directory where you have stored "KiteModeler.zip" and open the program "WinZip". "Extract" all the files. If you skip this step, you will only see a grey box when you attempt to run KiteModeler. Click on Kite.html to launch your browser and load the driver program. If you desire the full tutorial on the program operation, click on KiteModeler.html. Sound Wave Simulator allows you to explore the doppler effect and the formation of Mach waves. A "bug" generates a series of sound waves which are transmitted at the speed of sound. You can vary the speed of the bug from zero to twice the speed of sound (Mach 2) by using a slider. The change of wavelength associated with the doppler effect at lower speeds is illustrated. The formation of Mach waves which are inclined to the direction of motion at a unique Mach angle are also illustrated. Go to the directory where you have stored the .ZIP file and "Extract" all the files. Click on Sound.html to launch your browser and load the driver program. The program instantly outputs a selected property and displays the local temperature and pressure on gages. You can output the temperature, pressure, density, local speed of sound, Mach number for specified velocity, or the ratio of aircraft lift to the lift on Earth at sea level. Input and output can be given in either Enlish or metric units. Go to the directory where you have stored "Atmos.zip". "Extract" all the files. If you skip this step, you will only see a grey box when you attempt to run AtmosModeler. Click on Atmos.html to launch your browser and load the driver program. The GasLab: This is a series of computer animations which demonstrate all the possible combinations of the ideal gas law or equation of state. Gases have various properties which we can observe with our senses, including the gas pressure, temperature, mass, and the volume which contains the gas. Careful, scientific observation has determined that these variables are related to one another and the values of these properties determine the state of the gas. In a scientific manner, we can fix any two of the four primary properties and study the nature of the relationship between the other two by varying one and observing the variation of the other. The variations are demonstrated using computer graphics in the animated gas lab. Click Here to download a copy of Version 1.0 GasLab. Go to the directory where you have stored "GasLab.zip" and open the program "WinZip". "Extract" all the files. If you skip this step, you will only see a grey box when you attempt to run GasLab. Click on GasLab.html to launch your browser and load the driver program. This software is in the Public Domain. It may be freely copied and used in non-commercial products, assuming proper credit to the author is given. IT MAY NOT BE RESOLD. If you want to use the software for commercial products, contact the author. No copyright is claimed in the United States under Title 17, U.S. Code. This software is provided "as is" without any warranty of any kind, either expressed, implied, or statutory, including but not limited to, any warranty that the software will conform to specifications, any implied warranties of merchantability, fitness for a particular purpose, and freedom from infringement, and any warranty that the documentation will conform to the program, or any warranty that the software will be error free. In no event shall NASA be liable for any damages, including, but not limited to direct, indirect, special or consequential damages, arising out of, resulting from, or in any way connected with this software, whether or not based on warranty, contract, tort or otherwise, whether or not injury was sustained by persons or property or otherwise, and whether or not loss was sustained from or arose out of the results of, or use of, the software or services provided hereunder.